Once I got home I took a few more photos. 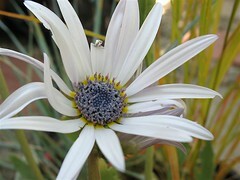 I noticed that the Lavender Pebbles were flowering and also the Blue Eyed Daisy I bought on the weekend. 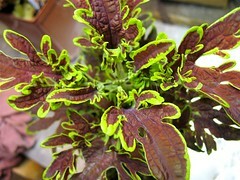 I took some of the Creeping Jenny that I rooted and planted them with the orange Coleus pot. 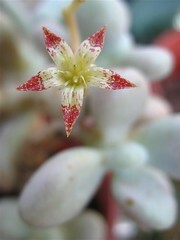 Hopefully it will flll out and cover the bottom of the pot. I finally set my first vegetable bed by getting the remaining old plants out. 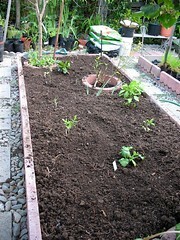 I then added some potting soil, compost, manure and fertilizer. In it I planted my Tomatoes from seed (Brandywine OTV, Great White and Roma), Pepper (New Mexico 6-4L) and a Zuchinni (Gold Rush). 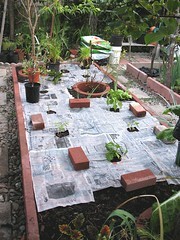 After planting the plants, I watered, then placed sheets of newspaper on top to retail moisture. I’ll cover the newspaper later with some kind of mulch. 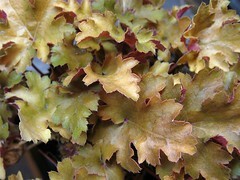 After all of that I took 12 more cuttings of the Lamium and planted them in the Mini-Greenhouse, like I did on Saturday. I then found some individual cell pots, washed them well, filled them with vermiculite and finally planted the Columbine seeds I took out of the refridgerator. 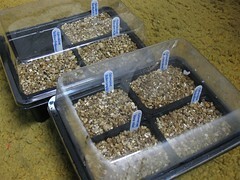 I spreaded the seeds on top of vermiculite, because they need light to germinate. Four of these small pots fit perfectly into the mini-greenhouse that I bought last week. 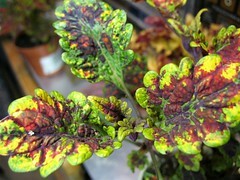 This entry was posted in Uncategorized and tagged coleus burnt sienna, coleus show and tell, columbine, heuchera amber waves, lamium, lyssimachia nummularia aurea, mid city nursery, pepper new mexico, purchase, tomato, tomato brandywine, tomato great white, tomato roma, vegetable bed, zuchinni gold rush. Bookmark the permalink.